Pre-owned buyers beware: saved game data in Resident Evil: The Mercenaries 3D cannot be erased, so if you pick up a used copy you're going to be playing someone else's game. There's an interesting note included with the Nintendo 3DS game Resident Evil: The Mercenaries 3D cartridge: "Saved data on this software cannot be reset." What's it mean? Given that the game automatically saves information upon completion of the game, it would seem to mean that if you buy a used copy, you're going to end up with someone else's save files, including any balance-whacking extras that unlock when the game is completed. It's apparently a new and admittedly creative way to discourage gamers from buying the thing used. Unlocking items and achievements is a big part of the gaming experience, after all, but everything will presumably already be accomplished in a used copy, and while buzzsawing through early-game enemies with late-game weapons is fun for a few minutes, it gets old pretty quickly. There's a reason you don't get the BFG on E1M1, after all. Maybe this gambit will curb used sales of the game, or maybe it will just encourage piracy a little further down the road. It seems to me that a lot of people who are serious enough about the game to insist on having their own go-round with it are also at least semi-likely to just pirate it if they can't find it new - or if they think Capcom is unfairly putting the screws to them. 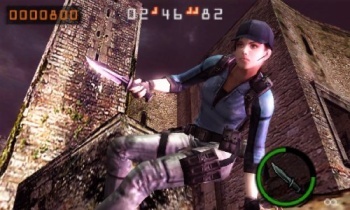 Resident Evil: The Mercenaries 3D comes out in North America on June 28.